My ornaments are special because I used what I had on hand and adapted a free pattern to make something unique. 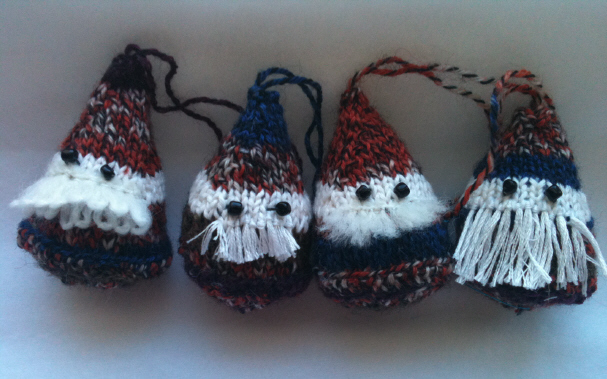 The stitches for these gnomes come from a free knitting pattern. I did not have the red and blue yarn of the original pattern so I instead used a self-striping sock yarn, that someone gave to me, for the hat and bottom. The face yarn was upcycled from an old cotton sweater I bought at a thrift store and unraveled for a different project. The beards were made from scraps of wide specialty yarn (bought at a thrift store for another project) and from embroidery thread looped on instead. Glass beads were used for eyes but I have made others where eyes were just bits of black yarn. My knitting needles were also bought for about .50 cents a pair at a local thrift store and the polyester filling was taken out of an old pillow. If someone doesn’t know how to knit, free video instructions can be found at knittinghelp.com and on youtube. I have since made several of these in different colors and used them for gift tags and teacher gifts at Christmas. Short pieces of scrap yarn are all that is necessary really. I can easily make a couple in an evening while watching TV. I have also turned this pattern into Christmas trees. Knit in one color, add embellishments of choice, and add less filling so that the bottom is flat rather than rounded. Use fabric scraps or buttons for tree trunks. I have even used real sticks gathered from the yard for trunks. Copyright © 2011 by Laura Larimore. All rights reserved.